Hi from San Francisco! We are seriously loving it here and we've only had one full day so far! I wasn't planning on posting while on vacation, but somebody (Nick) is still asleep, so I thought I'd share a couple photos and do a fun 20 Questions post that Blake did on her blog. Happy Friday! If you want to see more photos, follow us on Instagram (@sawissinger & @nmalburg)! 1. What brings you the greatest joy? Having Nick and my mom in my life. 2. What are your vices? I don't think I really have any... (maybe Nick can come up with some for me). 3. What is on your nightstand? A lamp and a book (House of Leaves). 5. What is your greatest indulgence? Online clothing shopping. But I will say that I am a very savvy shopper and I almost never buy something unless it's on sale. So I don't feel too guilty. 6. What should every woman try at least once in her life? No idea. Do whatever makes you happy. If I had to pick something that I'm glad I tried in my life, I would say it's moving away from my hometown. I love being able to call multiple places home. 7. What makes you laugh? Nick, always. He is the absolute weirdest person I have ever met and not a day goes by where he doesn't make me laugh. 8. What is one thing people would be surprised to know about you? I've never smoked a cigarette in my life (you're welcome, mom). 9. What is on your bucket list? I don't really have a bucket list (you can read our short-term summer to do list here). But I would like to travel and read a lot of books. 10. What is on your feet right now? Nothing! Just chilling in bed, waiting for sleepyhead to wake up. 11. How did you make your first dollar? Besides an allowance or selling friendship bracelets or things like that, my first real dollar at my first real job was from being a cashier and key-cutting extraordinaire at a hardware store. 12. What superstition do you believe in? I don't really believe in any, but living with Nick has ensured that my first spoken words of every month are "Rabbit, Rabbit" or else I'll have a terrible month (according to him). 13. What items in your closet do you wear the most? Probably black pants for work. But I try to wear a bunch of dresses and different shirts so I don't get tired of wearing the same things every day. Oh, and my Minnetonka moccasins. I can't wear them to work, but when I'm off the clock there's a 75% chance they're on my feet. 14. What is the best gift you’ve ever received? Everything! 15. What is on your liquor shelf? Always whiskey. I love a whiskey sour and Nick loves his on the rocks. Currently I think we have vodka and creme de menthe too. And of course pretty red and white paper straws! 16. What is on your kitchen counter? Pretty standard... Coffee pot and toaster. We also have a three tiered stand for fruit that we made out of thrifted vinyl records. Maybe we'll share a tutorial soon?! 17. What would you never leave home without? Clothes. 18. What movie has the greatest ending? Definitely not Requiem for a Dream. Maybe Saved? I love that movie so much. Is that embarrassing? 19. Who is on the guest list for your ideal dinner party? Nick, Lorelai and Rory Gilmore, Luke Danes, and Kirk. That sounds like a good time. 20. What is one thing you wish you had known when you were younger? Nothing, I like being surprised. Have a great weekend, dudes! I've wanted to try these black bean brownies for a long time because I was very intrigued by the idea of making a yummy, chocolately dessert that's healthy but will actually still taste good. I was definitely not let down. Want to try it? - Preheat oven to 350 degrees and grease an 8x8" pan. - Combine all ingredients EXCEPT chocolate chips in your food processor and blend until completely smooth. (I blended once, then scraped the sides with a spatula and blended again). - Once well blended, stir in your chocolate chips and pour into your greased pan. - Bake 18-20 minutes and let cool completely before cutting. (Seriously, I tried before they were completely cooled and it was a little messy.) Makes 9 brownies. These brownies were so good, it's a little ridiculous. They are super soft and chocolately. The consistency once they're completely cooled is actually more like a fudge than a brownie. Since we used coconut oil rather then vegetable, they had a subtle coconut flavor which I really liked. Plus, they are SO easy to make! Another A+ for our brand new food processor! I'm also really pleased that Nick loved them because he was definitely unsure about the whole bean thing when I suggested it. When we were photographing and sampling them, he kept telling me "Okay, these are just so good. I love them. They're my favorite." And they have BEANS in them, you guys. Can you believe it?! Also, here's a fun little GIF we made with the new Party Party app from A Beautiful Mess. Fun! Okay, we're off to SAN FRANCISCOOOOOO! Have a great week everyone. We'll be back next week to share our July books with you! P.S. Congratulations to Rachel, the winner of our first giveaway! If you guys enjoyed the giveaway, please let us know. We'd love to do more in the future! Okay, to tell you the truth I was going to do this project months ago, like when it was actually still cold out. It just got away from me and before I knew it, it was 90 degrees and I knew I wasn't going to be wearing long sleeves for months. But Nick and I are heading to San Francisco next week (woop, woop!) and the one thing I've been hearing over and over again is, "Dress warm, it's going to be chilly there!" So I decided alrighty then, I'm going to make this now so I have a cute sweatshirt to throw on in San Fran! I purchased this plain dark grey/blue sweatshirt from Old Navy on clearance for about $3 and thought it would be cute to spruce up with some heart-shaped elbow patches. This is a super easy DIY you can accomplish in an afternoon! Want to make your own? - Put on your sweatshirt or sweater and use chalk to mark where you want your patches to be. - Fold a piece of paper in half and draw half a heart along the crease in the paper. Use scissors to cut out your folded heart (which will be symmetrical when unfolded). - Check the shape and size of your heart on the sweatshirt. If you're satisfied, use the paper as a guide to trace two hearts on your felt. Use scissors to cut them out. - Attach your felt hearts to your sweatshirt with pins or stitch witchery (if you have leftover Sharpie marks, place them facedown). I used two small pieces of stitch witchery and my iron to attach my felt to my sweatshirt. This will help keep the hearts in place when you're sewing. 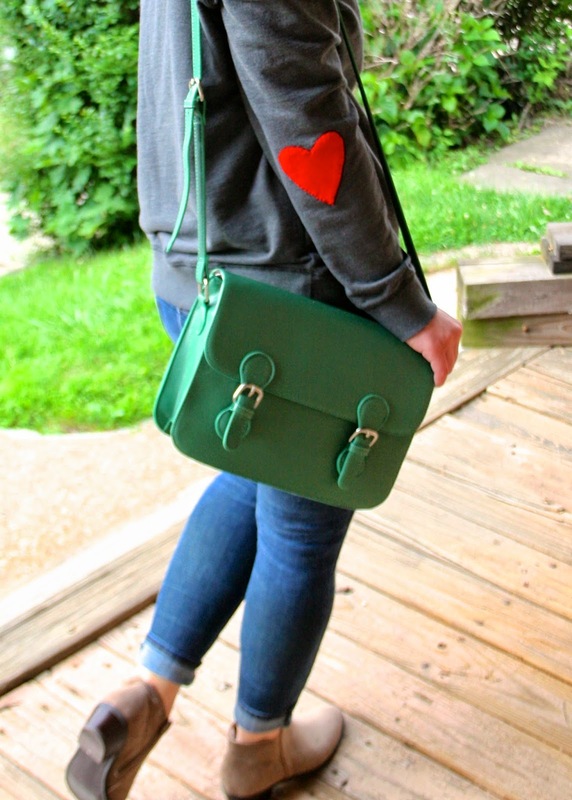 - Using your embroidery floss and a needle, sew your felt heart onto your sweatshirt sleeve. Knot tightly once finished. This project was super quick and easy (despite it taking me months to get around to). It was also cheap! I'm definitely ready to start sewing felt hearts onto everything. Maybe throw pillows next time? You guys know I love a good pillow project.